Another "national" holiday is upon is - oh who am I kidding there isn't a day of the year that isn't national or international something or other, but seriously, how could I let National Weatherman's (or Weather Professional's) day go by without doing this, because seriously, #cloudywithachanceofkittens is the best hashtag I've heard of in a long time; although next week's 'national day' is also pretty priceless too. My human wishes it were cloudier here - if it meant kittens! 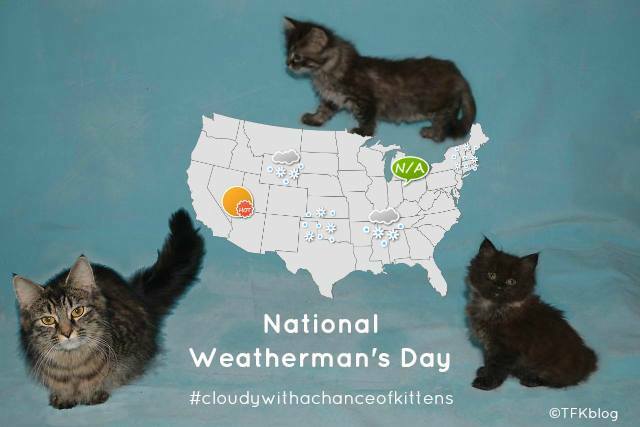 Cloudy with a chance of kittens is much better than raining cats and dogs. Cute pic of mama Lemon with her bebbehs! We have stoopid old rain here. Send Kittens! Okay.... just don't laugh if you see our Mom outside holding up a bucket to catch any kittens. MOL! We would love a cloud of kittens. That is too cute :) All we had was snow-I would rather have kittens. We cast away priceless time in dreams, born of imagination, fed upon illusion, and put to death by reality. See the link below for more info.